Cobb was born in 1328 in a small farming community of other gnomes just on the outskirts of Ashabenford. Not following in his fathers footsteps, Cobb worked for the local of Alchemy shop. Cobb showed much aptitude for it and excelled in the business. 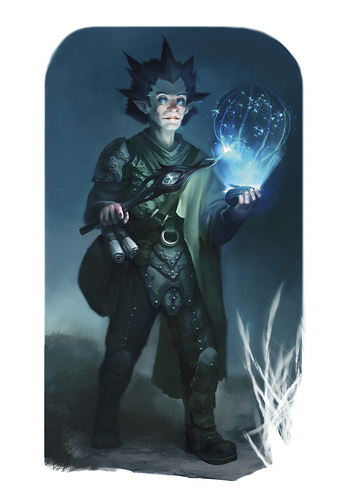 Cobb's exposure to magic and it's components, which are sold in the store, peaked his curiosity and over time he developed an talent for spell casting. A local elven wizard accepted Cobb's application to teach Cobb about the Weave. Cobb mainly deals with the customers and the supplies as they come in to the store. His older sister Kaylie works at the local tavern and his father is a local prospector. His mom died because of the war. Cobb's black and gray cat Kismat helps him find and catch the insects required for components and recipes. As a child Cobb played in the woods and explored the natural, yet tiny caves and tunnels with the other smaller kids. His Alchemy education only fueled his need to explore and find new resources for the store. Cobb knows Glimkin, Blitzcrieg and Gwendolyn from school and little people gatherings at the smaller tables during festivals. Cobb knows Krunk only by name and size. Cobb knows Aramith form his magic classes. Cobb at Level 4: cobb.zip / a web help file. Unzip and open the default page in a browser.